This is a compact and versatile multifunction copier for small and medium-sized offices. Canon aims the ImageRUNNER ADVANCE C2220L office colour printer at busy workgroups that need an easily upgradeable device for their growing needs, while the minimum investment is perfect for the budget-conscious user. However, the Canon ImageRUNNER IR C2220L colour laser printer may lack a few essential features that could compromise its efficiency. This is a fairly compact device that measures 650mm deep, 1117mm tall, and 565mm wide, but it requires at least 1109mm long and 846mm-wide installation space for the drawers and multipurpose tray. 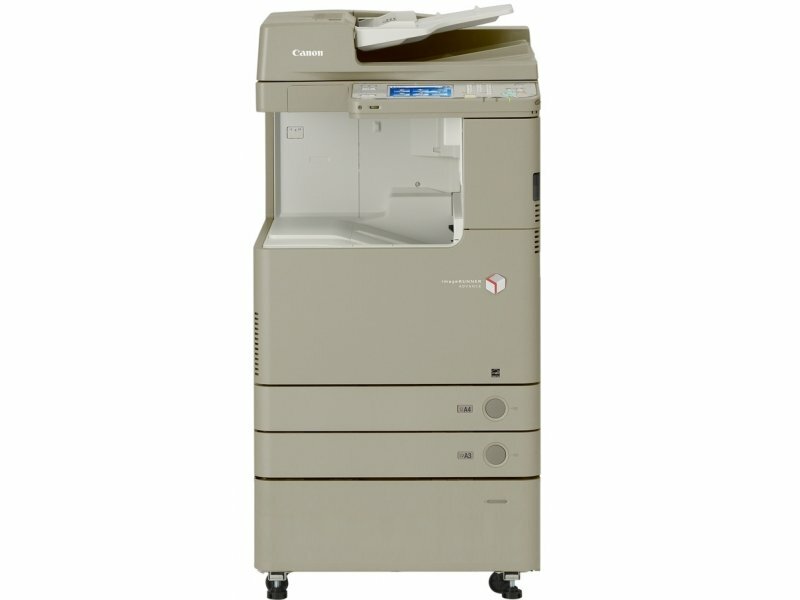 The Canon IR-C2220L colour copier weighs approximately 120Kg and with an understated frame, it can inconspicuously be installed in any office environment. The device is powered by a 1.67GHz processor with 4GB of flash plus 2GB of memory, and there is a built-in 160GB hard disk drive with 80GB of usable space. Standard input is via a 520-sheet cassette, a 550-sheet secondary drawer, and a 100-sheet multipurpose feeder. The interfaces include Ethernet, high-speed USB 2.0, and a USB host. The IR-C2220L can print in speeds of up to 20ppm in either monochrome or colour. It is easy to configure on-board because of the large touchscreen, and users can print on any type or size of media. The device is also praised for low energy consumption without compromising the quality of text prints, which are sharp and clear. The Canon IR-C2220L ImageRUNNER ADVANCE laser printer is also a network-friendly device with direct printing capabilities from USB memory keys and memory cards. The IR-ADV C2220L colour printer is a secure machine that lets administrators monitor and control usage. Long lasting C-EXV34 toners for the Canon C2220L help to reduce output costs. Upgrading the ImageRUNNER C2220L can be pricey. Staple, offset, collate, and saddle stitch finishers are optional, as well as additional functions like the super G3 33.6Kbps fax board. The Canon IRC2220L printer takes quite a lot of time to warm up when compared to faster machines. The print speed may not be enough when handling larger jobs.